Dividers currently out of stock - incoming soon. Please contact sales@filplastic.com or call 01430 410 450 to pre-order. The Supra Bin is a large heavy duty bin with a strong heavy duty reinforced base, sides and stacking rim. These bins are resistant to most industrial solvents and have been designed so that they can stack one on top of each other. The open front design allows clear access to contents and all bins have space on the front for labelling. The bins sit flush on top of each other and a stopper prevents the stacked bins from shifting forward. The Supra Bin is great for storing awkward good and larger items than your traditional parts bin due to its size and strength. These are often bought for picking walls. 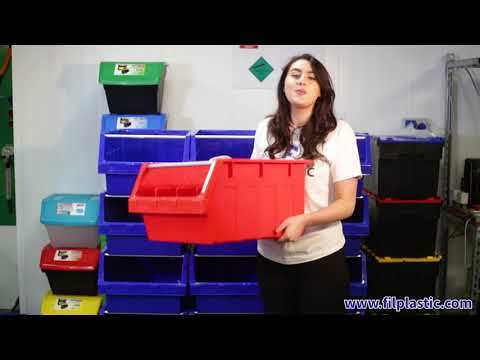 Each bin can be separated into 3 compartments with dividers if required (dividers sold separately). This variation is made from recycled black plastic - still as durable and robust but a more eco friendly (and cheaper) variation. Each stack of bins can carry up to 150kg, please refer to the drawing below. How well will these stack atop a loadhog box? I notice most of your containers have similar horizontal sizing are they designed to be somewhat interstackable? The Supra bin is not designed to be stacked on top of the Load hog boxes as they are a different system.